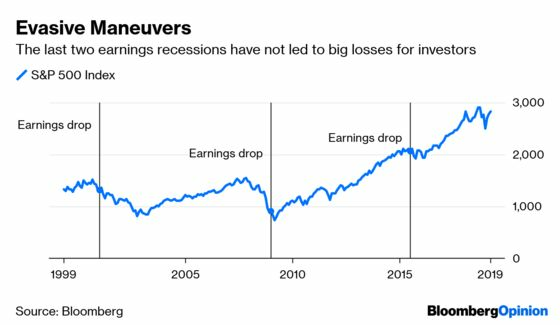 (Bloomberg Opinion) -- Investors and strategists appear to be willing to say “Earnings shmernings.” Later this year, the market could show that thinking to have been nonsense. Analysts have been warning for months that the first quarter could be bleak, at least from an earnings perspective, with profits on average dropping 4 percent for the companies in the S&P 500. But share prices have continued to rise, even as some of those poor results have been coming in. Earnings from Goldman Sachs Group Inc. on Monday sapped the optimism that banks would somehow buck the recent economic slowdown after JPMorgan Chase & Co. offered some encouragement on Friday, when it reported strong results driven by higher consumer spending. Still, shares of the S&P 500 are up nearly 3 percent since the end of the first quarter. The latest call that investors should just go ahead and ignore the first quarter’s bottom lines came from Thomas Lee. On Friday, the Fundstrat Global Advisors strategist, who grabbed some attention in 2017 for being the most bullish on Bitcoin among his peers, raised his target for the S&P 500, saying the index could rise an additional 7 percent in the next year, even if there is an earnings recession. The optimism, or rather lack of pessimism, about the market in the face of falling profits appears to be based on recent history. The last time there was an earnings recession was in mid-2015. The market did stumble slightly, but it rebounded quickly and has risen 41 percent since then. Lee points to 2009 — a year in which first-quarter earnings slumped 31 percent but the S&P 500 rose 24 percent — as his model for worry-free investing now. Lee says the similarity, besides falling earnings, is a Federal Reserve willing to lend a hand. The U.S. central bank has suggested no more rate hikes this year. 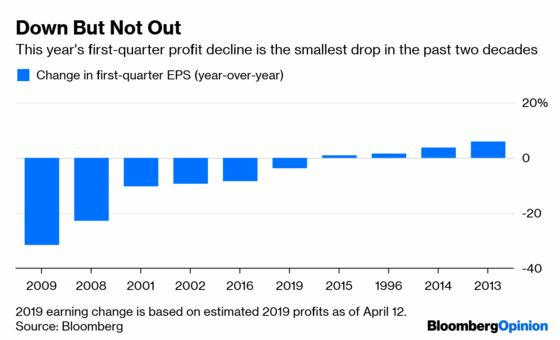 Some more evidence that earnings don’t matter, at least over short periods, is that profits were up double digits last year, yet the S&P 500 dropped 6 percent. The problem is there have been other times when investors have been hyper-aware of earnings drops. For instance, in 2001, when earnings fell into a recession along with the rest of the economy, the S&P 500 fell 13 percent. The S&P 500 tumbled nearly 40 percent in 2008, when the profits of the S&P 500 companies virtually disappeared during the financial crisis. It does look as if 2009 had some advantages. Stocks, after a big fall, were trading at nearly 13 times the next 12 months of earnings. But in mid-2015, like now, the P/E ratio of the S&P 500 was around 17.5. The real key to determining whether the current drop in profits translates into a similar one in the stock market has to do with the type of earnings recession. Many earnings recessions lead to actual economic ones. If that is the case now, then stocks will most likely drop, as they did in 2001 and 2008. If this is just an earnings recession that resolves itself without further economic pain, as it did in 2015, then stock investors would be right to continue to bet on a higher market. Of course, determining which one of those it is from this side of the profit drop is hard to do. Analysts do expect earnings to rebound, but not until the fourth quarter, more than enough time for the current earnings lull to do some real economic damage. Investors can ignore short profit drops. But earnings do say something about the future of the market, and the longer corporate bottom lines drop, the more meaningful what they are saying becomes.